← Why UHI cools the past ! This map is an interface to compare adjustments made by NCDC and CRU to about 2800 weather stations. Zoom in by dragging a rectangle over a region, and then click on a station. The resultant plot shows a stack of 4 graphs. The bottom displays the monthly average temperatures from CRUTEM4 (green) V3U (blue) and V3C (red). The next graph hows the monthly ‘anomalies’ relative to 1961-1990, and above that are the averaged annual anomalies. The top graph shows any adjustments made by V3C (red) and CRUTEM4 (green) relative to the ‘raw’ values V3U. The size of the red dots indicates the time span of the station. Clicking opens a new window. Close it, then zoom out (click anywhere) and select another station. An example graph from Iceland is shown below. 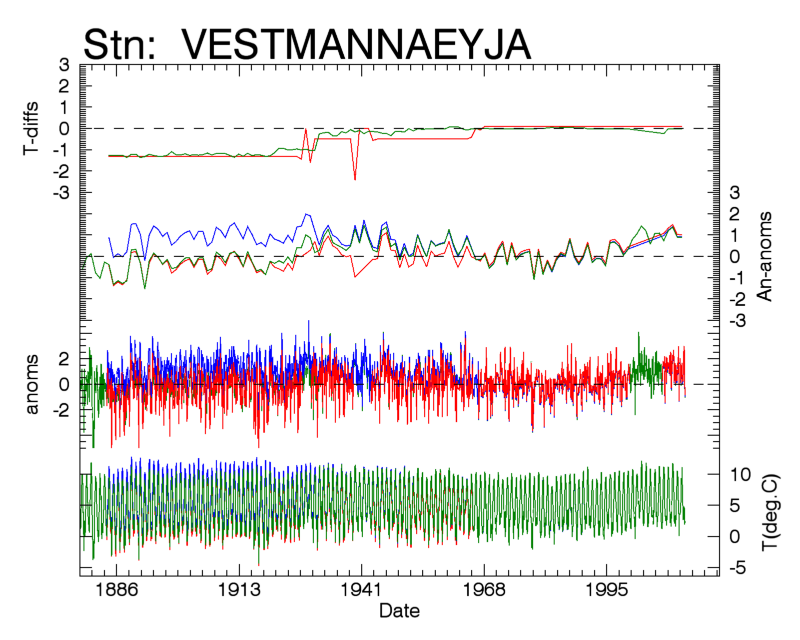 Temperature data for VESTMANNAEYJA. Anomalies are calculated relative to monthy normal values from 1961-1990. The top graph shows the net data correction/homogenisation applied to the raw values (V3U). Note the 2 stage offsets made before 1968. P.S. there is a redundacy in some of the US stations as NCDC add a last digit to WMO numbers for nearby stations. For the moment you get the last one – sorry. I can fix it later. This entry was posted in AGW, Climate Change, NOAA and tagged CRUTEM4. Bookmark the permalink. Clive, thanks for this quick and neat tool. Ever since your post when the topic of land temp rising faster than sea temp came up I had been studying the idea of analyzing for radiative imbalance through its fingerprint in the marine effect. If the Earth is in radiative balance, with the global mean surface temperature GMST remaining constant, then the sea should be alternately cooling and warming the land equally offsetting throughout each year. But in a warming imbalance the land temperature should rise with a larger anomaly than the sea since is has less heat capacity and there should be more and more days the land temperatures exceed the sea temps. Looking at the plot of historical land v sea temps there is a weak signal of a divergence starting in 1990 with CRUTEM3. But there is no signal when using RSS or UAH satellite data. So I’m thinking this conflict could be solved by studying trends by locality. The less of a marine climate that locality has the larger the divergence should be. Clive, can you supply the actual data for all these localities or direct me to your data source? That is an interesting observation. I just plotted the latest CRUTEM4.3 compared to HadSST2 and they show agreement until 1990 but as you say diverge after 1990. DS = 4sigma.epsilonT^3DT so the increased IR from land is about 1.5 W/m2 since 1990 !! All the land based measurements agree with CRUTEM4. The satellite data seems to shows less warming. How do they separate land from ocean ? Comparing 40 coastal stations with 40 well inland stations I was surprised to find that the coastal stations had by far the largest increase in the last 25 years. This is exactly counter to what I would have suspected if the oceans were cooling the coasts. Any thoughts? If I put one my conspiracy hat I would next correlate rising stations to liberal coastal towns versus conservative rural one. I forgot to mention I was looking at USA. Yes it looks like your right. I don’t understand either. There are quite a lot of US stations not included in the map because they don’t allways overlap with CRU’s stations. 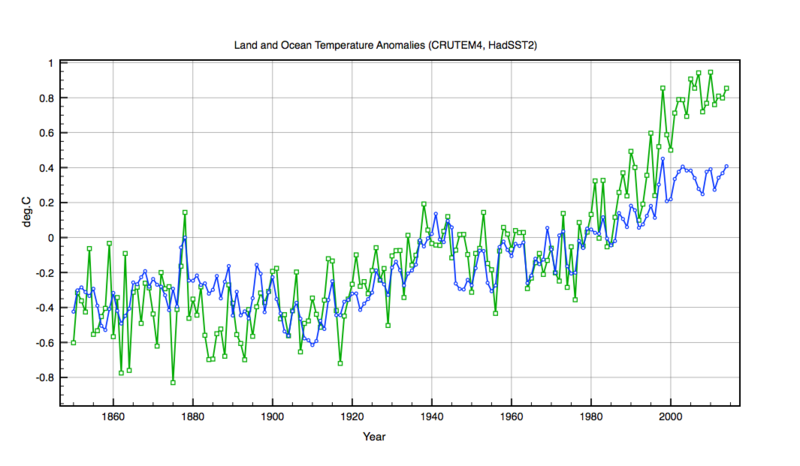 Below is a good example of how NOAA’s data homogenisation led inexorobly to increased warming since 1990. Santiago is in Chile and NOAH corrections added neary 2C of warming compared to the raw measurement data and those of CRU. 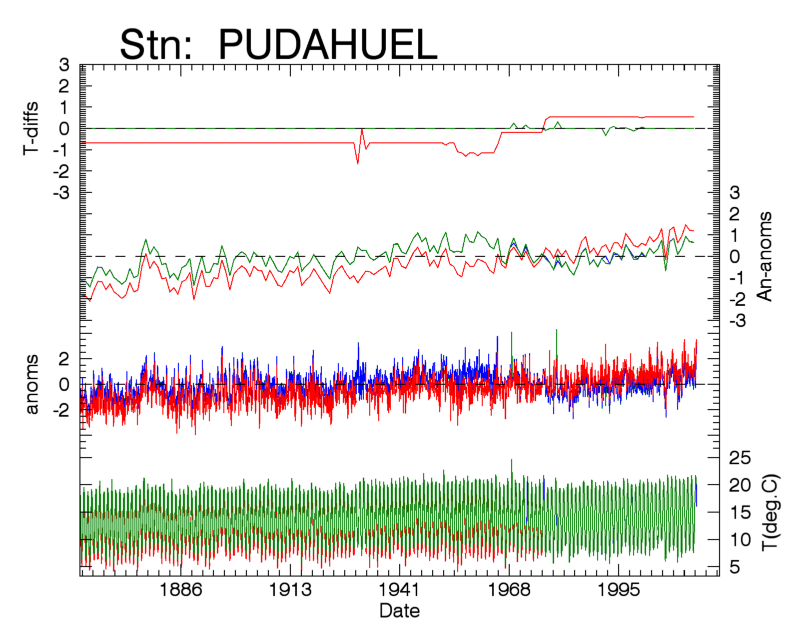 NOAH data corrections are shown in red in the top graph. Anomaly trends also in red. Wow, what a superb tool! Don’t lose this. I second NZ Willy, as I’ll be recommending this to anyone wishing to compare the data with their real world. Much appreciated. Isn’t it hard to believe that nobody from NOAA, NASA or CRU ever thought to compare local trends? Surely they have if only to check station to station error and variability. The fact that there is little pattern of anomaly among local geographies seems strange, even forgetting our expected increasing trend of station anomaly with travel inland. I am hoping you will be able to create a plot of temp trends for stations positioned on the west coast of USA versus the central states to illustrate this. If the same pattern of relationship appears on other continents also that would be a clue of something. We just don’t yet know of what. Perhaps Zeke, Nick or Robert will weigh in. Why do you believe that? Evidence? NOAA has a very similar facility for GHCN stations. Here is Vestmannaeyja. Unfortunately, it seems you can only access directly via the code numbers, but here there is a list by name – just click the radio button for GHCN stations. Alternatively here is a Google Map which when clicked pops up a link, and can be used to classify in various ways. As for map of station trends, there is one here which shows trends by shading. The color is right for the station itself, and shaded in between. You can choose time intervals. For US it’s a mess, because the US shows a patchwork. Part of the reason is that the default data is unadjusted, and included the TOBS vagaries. You can request adjusted, which helps. Nick, I suspected that I could not be the first down this path. And, thank you for your sharing of what is clearly a life’s dedication to organizing the data for the study of these types of questions. I am blown away with the globe trackball tool. Playing with the trackball dates, adjustments and localities for a while, I can see a good picture of trend evolution and adjustment affects. There is only a slight preponderance of warming over land but there seems to be a stronger association with NH for warming than land. For example the Arctic is red hot but the whole of Australia consistently is cooler than the seas surrounding it. Nick, do you understand my point about expected land warming due to lower heat uptake on land? If there were no oceans, for example, climate sensitivity should be much higher (from my view of the science). What are your thoughts about the apparent fact that temp variations over land masses affect climate trends record less than data error? Well, I don’t think it is true, at least over multidecade periods. But if it were true, it doesn’t affect the physics. It just reflects what observations were taken, and then you have to find out some other way. With sensitivity, it depends on time period. Oceans absorb heat for a while, but it doesn’t go away. What is commonly quoted is equilibrium sensitivity, which is what is left after all such heat sinks have been filled. Of course, that is theoretical, since deep sea etc will absorb heat at a low rate for many centuries. Equilibrium sensitivity expresses the surface temperature which will bring the world back into radiative balance, and I don’t think that is much affected by land/ocean issues. Nick, I do not dispute your description of equilibrium climate sensitivity. But, whereas the seas are the main point of heat uptake, and whereas this well-known effect is responsible for the sea’s seasonal warming lag relative to land, one would logically conclude the sea’s reaction to any warming would lag that of land. And, as the GHG concentration curve steeply rose after 1940 one would expect to see a gradient develop gradually and globally with overall tropospheric warming. And, this land/sea gradient should be appearing regardless of sea current caused temperature variability and regardless if surface waters near coastal edges are typically warmer than average. That is because GHG should have had no affect on these dynamics nor the baseline temperatures for which the anomalies are compared. If coastal areas are cooling more of the year than warming they should be cooling less of the year now than in the past. Nick, wouldn’t you agree with this? If so, why would this effect not be seen in everywhere including Australia?